I would like to formally apologize to the drivers of Ontario and Nova Scotia. I am a menace to both provinces’ roads. But I beat the system, and maybe you can too! Since I received my G2 driving permit in Ontario, I doubt I’ve driven a motor vehicle more than 10 times. A G2 permit isn’t a full driver’s license. It allows someone to drive alone, but there are certain restrictions regarding blood alcohol content and passenger limits. Here in Nova Scotia, the license system is less graduated. There’s only a learner’s permit and after a road test, a person is considered “Newly Licensed.” These new drivers have a two-year probationary period, with restrictions similar to the Ontario G2. In Ontario, to go from a G2 to a full driver’s license, you have to do another road test. In Nova Scotia, you just need to wait two years and complete a defensive driving course. He also mentioned that his Ontario permit was going to expire before he could come home a do a road test. “That just made it imperative,” he said. 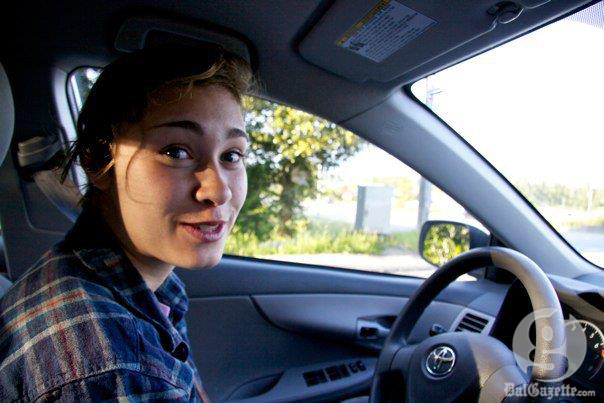 Amelia Wilding is a third-year University of King’s College student who procured an NS license after losing her original permit from British Columbia. “By doing that, I would get a full license, instead of having to do one more exam in BC,” she said. According to Service Nova Scotia’s website, “you need to get a Nova Scotia driver’s license within 90 days of becoming a resident,” and you’re a resident if, “you are attending school or college here.” Not only is it efficient to switch licenses, it’s required if you’re driving. Not wanting to let my permit expire, and too lazy to arrange and practice for a road test in Ontario, I decided to do the inter-provincial switcheroo. On Jan. 23, I hopped on the 52 crosstown bus and headed for Access Nova Scotia. The office was located in Bayers Lake—a mystical land where only the brave out-of-province students have gone before. It was nestled under an overcast sky, beside big box stores and underused parking lots. I walked from the closest bus stop over exhaust-stained, automobile-chundered snow to the government office to get my new license. Upon entering the building, I felt a sense of peace. It was warmer in both temperature and colour. The walls were yellow and used studio lighting. There were prints of oil paintings on the walls: a small boutique in Europe, some flowers, a few abstract works. I saw the boutique print repeated twice. Because Access NS is a 45-minute bus ride from the peninsula, there wasn’t any lineup when I arrived. I took my number and walked directly to an open teller. The process of switching my license was quick. $70, some paperwork, and a horrible mugshot later, I had a brand new, full Nova Scotia drivers’ license. It expires in 2018, and I won’t have to do a road test in Ontario until I’m 80. This obviously poses a threat to road safety. I now have a license that upholds me to standards I’ve never actually met: highway driving, for example. Should the registries’ policies change? Maybe, but that would probably cost the taxpayer. The problem here isn’t in the conversion of similar licenses between different provinces, but that I don’t drive often. But I’m not an exception: there are 3,068 undergraduate students from Ontario who attend Dal. Not all of them drive in Halifax, where they live for most of the year. If they have a permit from their home province, it may expire by the time they graduate, forcing them to start over again. This puts them in a situation similar to mine. The question I’m getting at is: What if 3,000 inexperienced drivers did what I did? is this still the case? I’ll be attending in the fall and my license expires fairly soon.